The first time he logs himself in, the user is redirected toward the personal project editing interface where he can set up every aspect of his personal query building interface. The user needs to define a geographical scope for his future queries and to choose a chronological frame, some maps elements, databases and the categories and characterisations among those available. Every user can customize some aspects of the query interface. The aim of this customization is double : first, it allows the users to have a tool centered on their needs, secondly, the app is enriched by everyone specific needs. This interface is accessible anytime in the project's preferences menu on the app. The user chooses on a map the center of the area that will be used as the initial research area. In the thematic table, the user will only be able to see the elements with at least one dot of their geographical scope on this initial research area. The table is automatically updated every time the research area is changed. This update concerns the chronologies, maps and databases available on ArkeoGIS. The users can also indicate, in the options, the temporal frame of their research's period. In the thematic table will be made available the chronologies, maps and databases whose starting and ending dates are within the chronological frame requested by the user. Specifying those chronological limits allows the user to only get informations concerning this specific frame. This table is automatically updated when the working time frame is modified. The chronologies, maps and databases available on ArkeoGIS are concerned by this update. 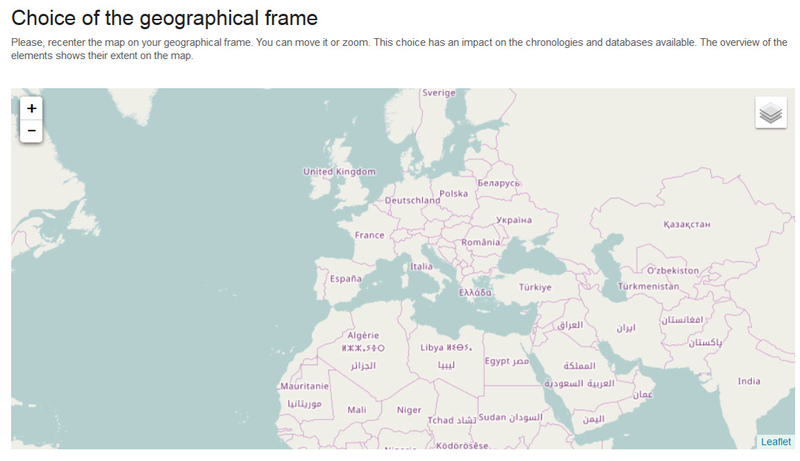 The list of every available element in the selected geographical and chronological frames can be found on the thematic tables of this interface. The illustrations below depict those options for the creation of the user's personal project. These tables can be ordered thanks to the title of each column or the user can make a text search to organize it. Among all the chronologies created by the ArkeoGIS’ administrators, the user will only be able to use those concerning the geographical scope he chose in his personal project. During the overview of the line presenting a chronology, its scope will be displayed on the selection map of your working area. The user must choose one of the listed chronologies to be able to build a personalized query. The following elements are used to describe the chronologies: available languages (at least two, including English), name, starting date, ending date, description, author, chronology’s download in the two languages. Among all the background maps (WMS) or the shapes (SHP) created by the ArkeoGIS’ administrators or by its users, the user will only be able to use those concerning the geographical scope he chose in his personal project. During the overview of the line presenting a background map (WMS, WMTS) or a shape (SHP), its scope will be displayed on the selection map of your working area. The user can choose as many maps or shapes as he needs to build a customized query. The following elements are used to describe the maps and the shapes: name, starting date, ending date, zoom level (WMS, WMTS), author, description and type (SHP, or WMS, WMTS). Among all the databases created by the ArkeoGIS’ users and administrators, the user will only be able to use those concerning the geographical scope he chose in his personal project. During the overview of the line presenting a database, its scope will be displayed on the selection map of your working area. The user can choose as many databases as he needs to build a customized query. The following elements are used to describe the databases: original language, name, starting date, ending date, description and author. The user can choose as many categories as he needs to build a customized query. After that, he can edit it only to keep the useful characterisations for his project. The following elements are used to describe the categories: name, description, number of personal modification(s) and a button to edit the category. Anytime, the user can edit his choices. They will always be visible and updated according to the new scope or chronological frame chosen by the user. If his new choices are not compatible with some elements on his personal project, a message will alert the user.